You would think ducks, with their aerodynamic abilities, would be immune to the menace that is a strong gust of wind. Alas, four little ducklings and their mother are about to learn the hard way in Duck Quest, a pleasant adventure game by Waffle Friday Studios, that a breeze is nothing to mess with. As Mother Duck, move with the [arrow] keys. The park is a wide open space so you'll have to search all over and interact with obstacles by pressing [E] and to peruse your inventory click on your [W] key then hit [enter] if you wish to use that item, or want to finish dialogue. During the hunt quacking with [Q] while standing still will reveal if one of your ducklings is in your area. There's a healthy dose of walking in this adorable game and unfortunately Mother Duck is a lethargic waddler so be prepared for a slow pace during your adventure. Still, there's nothing wrong with a calm jaunt through the park, even if it is only in a game. The story is sweet, light hearted, and long enough to keep you entertained while going about your day and something that can be shared with even the littlest of your household for a nice bonding experience. In short, it's a quacktacular. Thanks to Delilah for sending this one in! 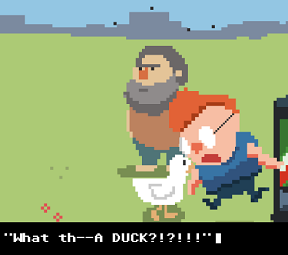 Duck Quest Walkthrough now available! Investigate the trash can. Pick up the bone. Move up to go to the screen with the dog. Give the dog the bone. Go right then down twice until you're at the screen with the hobo. Give the hobo fleas. Go down once more and quack at the boy at the soda machine. Pick up the hot dog voucher. Go over three screens to the balloon man, go up once and investiate the bush. You will receive a baseball cap. Go up one more screen to the hot dog vendor. Give the hot dog voucher to the vendor to receive your first duck. Go right once to the man with the saxophone. Interact with him to have him and the hobo musician start playing together. You will get the second duckling. Leave the scene and come back to it then interact with the saxophone player again to receive money. Go back to the vending machine and use the money to get a soda. Go left until you reach the balloon man again. Give him the soda. Go far right until you hit the soda machine then go up all the way until you hit the big tree. Once there quack. Use the balloon to float up and rescue your duckling. This is your third duck. Go down to the painter and investigate this painting. Speak with him to find out about the man who lost his hat. Go down until you hit the vending machine then go left once. Give the man the baseball cap. You found your fourth and final duckling! PSA: WHEN CROSSING SCREENS TO LEFT/RIGHT, AVOID THE TOP-/BOTTOM-MOST PART OF SCREEN. You may get stuck. Many times. Get FLEAS from the trash can at the start screen. Go north 1 screen and use FLEAS on Punit the dog. Go south 2 screens and east 1 screen. Use FLEAS on the Vagrant Drummer, who joins you. I guess you like being followed around. Go west 2 screens and north 1 screen. Talk to the Sax Player (you have to be right next to him, no box in between). Enjoy jamming, retrieve duckling. Talk to the Painter (east side of the park, just left of the start screen). Talk to him again to get directions to Top Hat Dude. Go 1 screen west and 2 screens south, to the park entrance. Talk to Top Hat Dude. Go 2 screens west and 1 screen north, to the berry bush (and aesthetically pleasing trash can) on the west side of the park. Get a BASEBALL CAP from the berry bush. Go back to the park entrance and use the BASEBALL CAP on Top Hat Dude. Duckling retrieved! Go 2 screens east and 2 screens south, to the Vending Machine. Quack at the kid (press Q) to scare him off. Use MONEY on the Vending Machine and get an epic product placement MOUNTAIN DEW®. Go 4 screens west to the Balloon Seller. Use MOUNTAIN DEW® on the Balloon Seller. Get BALLOON. Go 4 screens east and 4 screens north, to the NE corner of the park. Use BALLOON on the oak tree. Hooray, duckling! With your HOT DOG VOUCHER in beak, go to the hot dog stand (1 screen south of the NW corner of the park). If you don�t already have a HOT DOG VOUCHER, go to the vending machine (SE corner of park) and quack at the boy (press Q). Pick up the VOUCHER (careful not to stand on it or you can�t pick it up). Use the VOUCHER on the Hot Dog Man. Get a duckling. Hooray! Enjoy the super-adorable end animation. D�aww. If anything, I'd make the movement a tad faster (but then again, that's being a duck, I guess) and the game a bit longer. Very nice! Moved onto it and then could not move off in any direction. I got the bone from the trash can and gave it to the dog, getting fleas. One duckling is in the top right tree, one is in the saxophone, and one is in the hotdog stand. Not sure where the 4th is. I need a drink for the balloon man and money for the hotdog man. Not sure what the fat kid at the vending machine wants, or the pair of women feeding pigeons/reading, or the old lady. I also have a baseball cap, but don't know what to do with it, or the fleas. You have to quack at him. I had the same problem as yaddab on Chrome. I opened my inventory when I had no items and couldn't exit. Press W again to close your inventory. Where you give the Mountain Dew (Lord of the product placement) to the balloon guy. Now the game is frozen and since I've already found my other 3 ducklings I couldn't be bothered to replay. Especially since the mother duck's speed seems to be set at glacial. Cute graphics though. Meanwhile, I can't figure out how to get the Mountain Dew. Are you kidding me? First time, got 3 ducklings and stuck on the drummer, just like yaddab and Zanoushe. Second run through, got three duckings AGAIN, gave the drink to the salesman and everything just plain freezes. Am I SUPPOSED to be unable to reunite my duck family? The duck was tooooo slow! I'll have another go at this perhaps as I like these kind of adventure games but the walking speed is just such a put-off. Found the same bug as the others after trying to play twice. This game's cute, but I can't play it again until they fix it. This game's super cute, but doing almost anything causes it to freeze. So far for me, that's talking to people or picking things up. With no save function, it's pretty much unplayable until fixed. Quacking and getting tiny quacks from my ducklings in reply is adorable though. Aw. The game has never frozen for any of us here at JIG. Would those posting that the game freezes please post what version of OS, browser, and Flash Player you're using, please? Other than that, super cute game. I love the art. I would complain about how slow you walk, but hey, it adds to the experience. 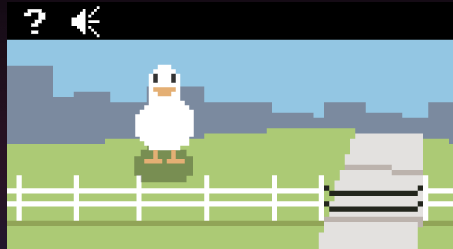 Not gonna refresh just to get one duck, but I might replay if they fix the glitches.